2018 hasn’t been a particularly memorable year for fleet-footed Irvinestown forward James Duffy. He has spent more or less a full season kick his heels due to injury and it is only over the past six weeks that he has finally got game-time. “It would be fair to say that at this stage I’m still a little bit rusty,” says the attacker. That may be the case, but Duffy will be one the players Irvinestown will be looking to to help them to victory in Sunday’s decider. He is a critical figure in an Irvinestown attack which on its day can give any defence their fill of it. 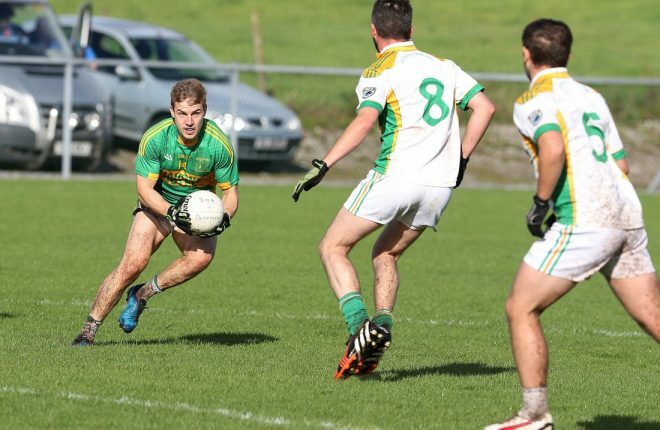 After a promising early league start, Irvinestown found themselves slipping down the table and ended up in the relegation zone. “We have that to face later on, but for the moment the focus is on the championship. In that victory over Newtownbutler, Irvinestown delivered a razor sharp attacking display, full forward Ronan Ormsby in electric form, but there was terrific input too from old reliables Gary Maguire and Duffy himself, underlining the quality of the side in the final third. A wonder goal from defender Jarlath Maguire sealed the result for them after the First Fermanaghs had staged a comeback, a comfortable seven points to spare at the end. Onto the semi-final and here it was Irvinestown who had to chisel out a comeback against a St Patrick’s side who perhaps would have been pre-match favourites. And that is what materialised with the Donagh men fast out of the blocks and heading into the second half with a decent lead. A tough championship battle and one which should stand them in good stead as they now face Belnaleck. Duffy brushes aside the suggestion that simply because Irvinestown are in a higher division this marks them out as favourites. “The way I would look at it is that there would be little to separate a number the leading sides in league two with all but a few in the top division. “As far as I would be concerned Belnaleck are a good side with some serious players on board. “And that’s not just their current county panellists, the Cullen brothers and Kane Connor. Irvinestown will however have to bear the burden favouritism for this game, whether they like it or not. They have a defence which will be organised by stalwarts such as Shane Goan, John McElhill and John Doonan. Strong too in the middle of the park, the input of Liam Murphy especially important and of course they have that slick attack, bolstered now by Duffy’s return to the fray. Signs do look good for them in what should be an entertaining and free flowing tussle.